Woodchucks, also known as a groundhog or whistlepig, occasionally eat garden or field crops and can cause considerable damage in a very short period. 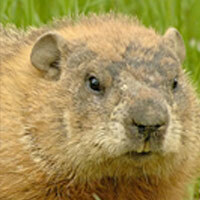 Because woodchucks hibernate, they are unlikely to cause any damage between early November thru late February. Damage done during this time is more likely to be caused by deer or rabbits. The woodchucks burrow systems are intricate and can often disturb our yards or even structures. They can create denning sites under our porches, sheds or even homes in search of hibernation and breeding locations.